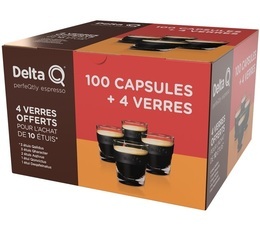 Discover our range of Delta Q capsules for an excellent coffee roasted in Portugal. These Delta Q capsules are tailored to fit with your Delta Capsules machine: Delta Qool Evolution, etc. We offer a large range of Delta Q capsules at the best prices: coffee, decaffeinated, tea, flavoured coffee, etc. Vary your enjoyment easily with the Delta Q system!